Welcome to Pocket Power Toys! 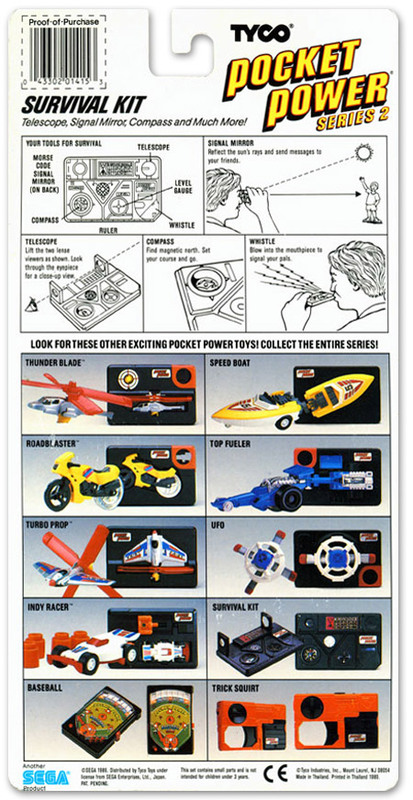 Pocket Power was a line of toys created by Sega in 1988, and distributed by Tyco. The toys came with the catchphrase "Power that Packs in your Pocket!" and that essentially sums them up - small, credit card sized cases hold all manner of fantastic toys that you can easily take anywhere. The original Japanese release went under a different name - Card Power. 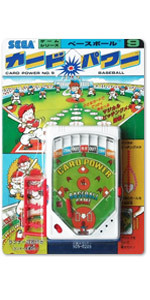 Whereas Pocket Power was split into 3 Series, Card Power was a single numbered series (although some artwork style changes could suggest a similar Series breakdown). Both ranges were sold between 1988 and 1990 for about $5 as single carded items. I've found a picture of 3 toys on a single card, but it appears to be non-official. From my research, these 3-packs were sold at a closing down sale of Nova Fontana in the Philippines in 2007. I believe them to be non-official since the Baseball set has it's runner pegs removed and the packaging is simply the single packs. It appears these have ended up on Ebay (currently being sold loose & separately by seller laneb1961) since they list most of the sets pictured in the 3 packs, are located in the Philippines and finally their Baseball is also missing the runner pegs. 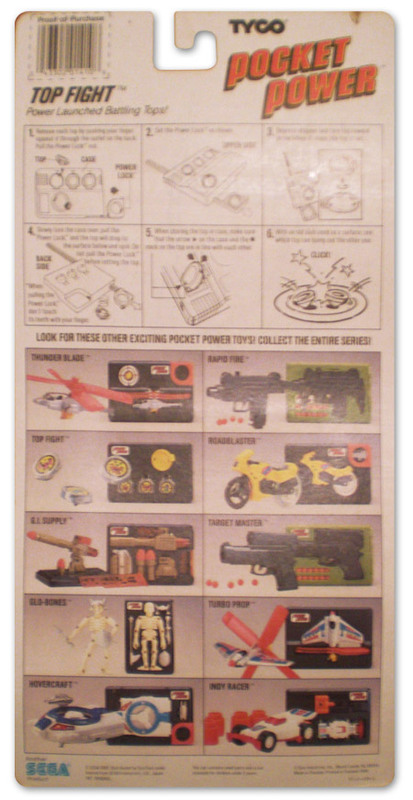 There is some degree of confusion regarding the Series 3 Pocket Power Toys, as their existance is only confirmed by the Bowling toy packaging, which unfortunately does not show which other toys were in Series 3. Some mystery Pocket Power toys have been uncovered, but their names and functionality can only be guessed at this point in time. Thanks to toyrewind.com for posting this! 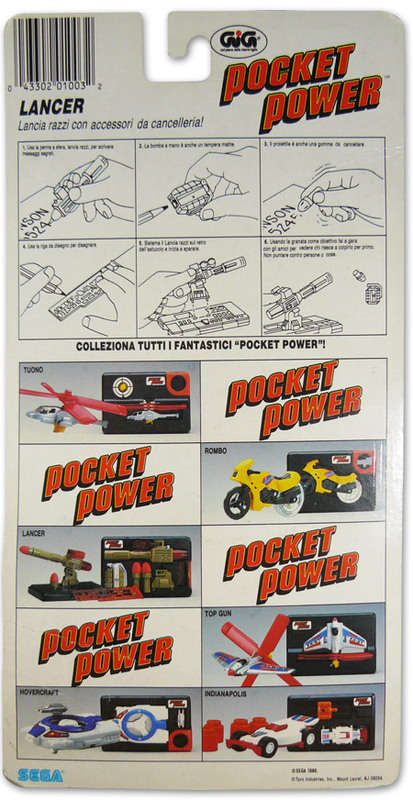 I used to have a number of Pocket Power toys as a child, but at some point my mother threw them all out. I decided to re-acquire them and was soon stunned to find virtually no information on the internet - one of the few subjects remaining not to have a Wikipedia entry! As a result, I decided to make a website with the aim of being the most in-depth resource for fans of Pocket Power. Now that i've almost completed my collection, i've launched the site with every bit of information I could find. There are still a lot of holes though, so i'm hoping I can get some contributions to help complete this information resource, discover the mysteries of Series 3 and of course, complete my collection! 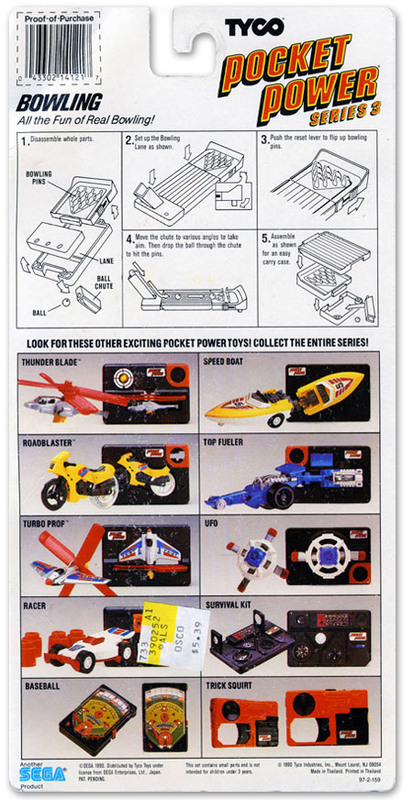 Thanks for reading and hope you enjoy checking out all the Pocket Power toys by Sega! I'd just like to thank a few people who have contributed to this site, or had their own information that i have also used on this site in the absense of my own. Tets' Toys & Shenanigans for providing official video reviews! Be sure to check his site for other great toy reviews! Crazy at Powet.tv for several Pocket Power packaging photos and his article also inspiring me to create this site! Virtual Toy Chest for the pictures of Lamborghini, Submarine & Skateboard. Sergio, whom I contacted out of nowhere based on a post of his on some website somewhere, asking him to sell me his Rapid Fire - which he did! 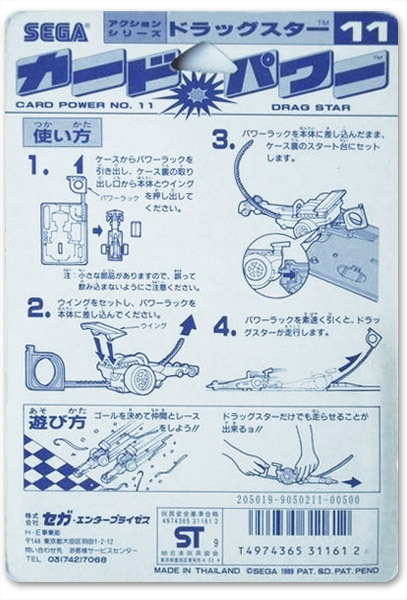 Robert at Red Star Robot for listing Card Power toys on Ebay - finally confirming the name of Pocker Power in Japan, allowing me to expand the site's content considerably! Several Ebay sellers who have played a part in my re-acquisitions: carmstro1, sa_ku_ra, laneb1961, failte980, scaughtk8 and robertaemporio, all of which come highly recommended. Michael Conjerski, for no reason, just because. Isn't that a reason though? If you have any information you'd like to contribute to this site, or want to help me finish off my collection, please contact me using the following form! Confirm Email * office use only, please leave this field without text. You should not be seeing this field as it has been used to detect automatically generated form requests. 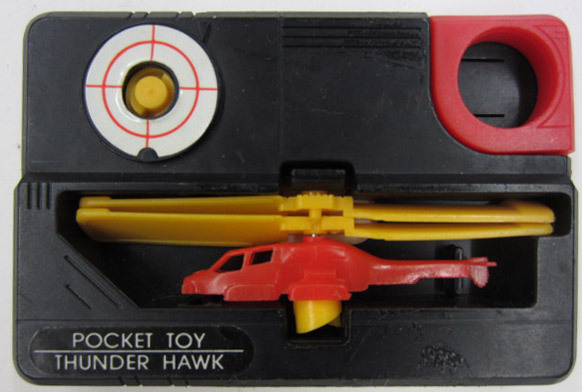 The Pocket Power Thunder Blade toy is rip-cord powered helicopter toy. The helicopter is stored in the case with its blades collapsed. Removing the helicopter by pushing on the underside of the case, you can then expand the blades into a cross position and place the helicopter into the launcher, marked on the base with a target symbol. Remove the rip-cord from storage and insert it alongside the launcher slowly, and then pull out the rip-cord quickly while aiming the helicopter. This Pocket Power works quite well - it connects solidly with the launcher and will fly about 5 metres in length and about 3 metres up, depending on the angle you launch from. Presumably to help with staying airborne, this is one of the lighter Pocket Power toys, being mostly hollow and entirely made of plastic. The design is particularly basic with no decals unfortunately. Interesting to note, this toy is called Thunder Blade in both the Western and Japanese release. It was assumed this was a reference to a Sega helicopter shooting game released into arcades and later other platforms, under the same name. 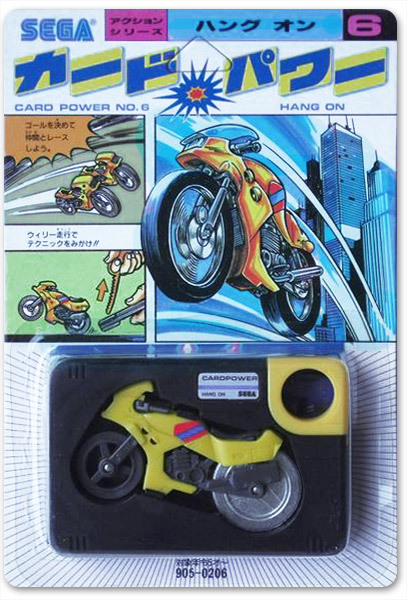 This suspicion was confirmed when it was discovered that the Japanese release of the Roadblaster motorcycle is actually named Hang On, another Sega arcade game. There are no screws on the back of the base. Contributed by Tets' Toys & Shenanigans. Visit tetstoys.blogspot.com for more great toy reviews! 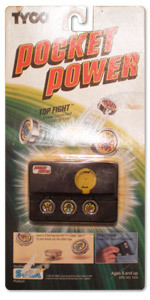 The Pocket Power Top Fight toy is a set of 3 miniature spinning tops. Upon removing the spinning tops by pushing from the underside of the case, they are loaded into a launcher (sticker facing the yellow), and held lightly in place by some indentations on both the tops, and the launcher. The rip-cord which is stored on the back of the case, can then be inserted alongside the launcher. With the base held carefully upside down (to stop the tops from falling out), pull the rip-cord and the top will (hopefully) eject and spin on a hard surface. The launcher has a yellow protrusion that appears to be for stopping the spin and helping the top eject from the case, but in practice this is quite difficult to do! This case has a warning sticker on the back to avoid putting your fingers near the rip-cord, the only Pocket Power with such a warning. The tops are entirely diecast metal, with a unique sticker decal on each. There is a bat (marked with one star), a serpent (marked with 2 stars) and a crab (marked with 3 stars). I have a suspicion that the characters may be from a Sega video game but which one, i don't know! If anyone recognizes them please contact me. Top Fight is a pre-cursor to modern day Beyblade toys, but it is difficult to imagine children having much fun due to the difficulty of achieving a good spin. Whilst the decals serve to identify multiple players in a stadium style spinning match, both players would need their own base to launch their tops competitively - using your hands to spin the tops doesn't result in a very quick spin because of the small size. Of note, this Pocket Power is the only one that has a pink rip-cord. Initially i thought this might simply be a faded red rip-cord, but the colouring of the top decals, and several sightings of Top Fight seem to confirm it was intentionally made pink for some reason. Top Fight is fairly rare based on auction sightings, and unfortunately pretty disappointing, considering how well rip-cord spinning tops work these days. Not a good case for the old saying "They don't make em like they used to", rather, "They make them better now"! The Pocket Power G.I. Supply is a miniature stationery set. The case consists of a gun emplacement and mounting piece, 2 missiles, grenade and a stencil/ruler. The gun emplacement's rear is covered by a translucent cap that protects a functional (in 1988 maybe!) pen. There is also a translucent sight that can be rotated out to help with aiming. The missiles have erasers on their tips, and can be inserted into the gun emplacement and fired quite powerfully with a spring-loaded mechanism via a button on top of the emplacement. The grenade is actually a cleverly disguised pencil sharpener. Finally, the mounting piece allows you to set up the emplacement on the case, giving the ability to tilt up and down, as well as rotate 360 degrees before firing the missiles. The case also has 2 feet that slide out on the bottom, that let the case stand on its own, presumably so it can look like a weapons rack on display - a nice touch! This set really has a lot stuff packed in - I can imagine children getting a lot of use out of it (and then having a hard time with the tight fit of some of the pieces!) Surprisingly though, sets that have shown up on auction seem to have unused eraser tips - perhaps even kids thought it was too nice to use! Having many pieces though, auctions are often missing components. 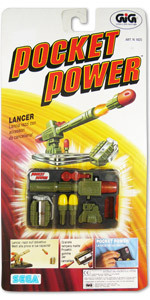 The version shown here was originally a sealed Italian release and goes by the name Lancer, although the toy itself appears to have no changes. The cross-sell on the packaging, and TV advert however have an orange/red eraser colour, whereas the actual release seems to have used yellow. 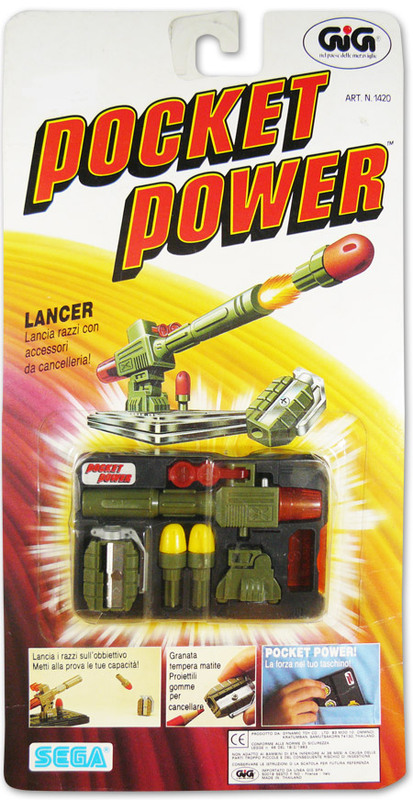 The Italian packaging is notable for it's exclusion of 4 of the Series 1 Pocket Power toys - Target Master, Rapid Fire, Glo-Bones & Top Fight. This seems to suggest that not all of them were released there, at least not in Series 1. 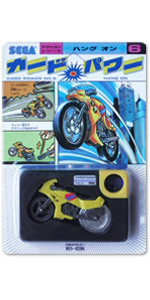 The Italian toys were also released by a company called GiGi rather than Tyco or Sega themselves. 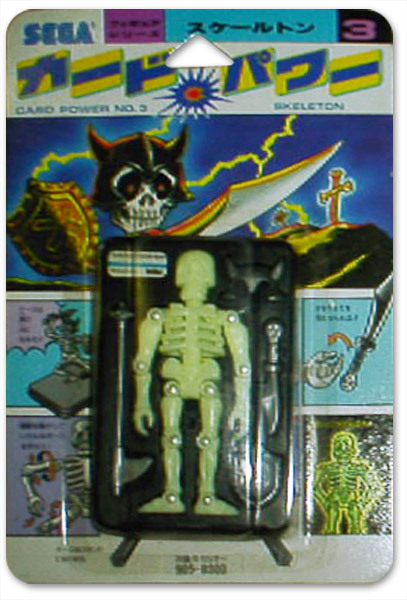 Glow In The Dark Battling Skeleton! The Pocket Power Glo-Bones is a glow in the dark, miniature skeleton action figure. 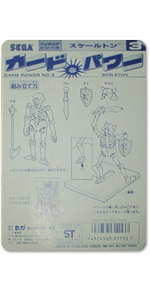 The case consists of Glo-Bones himself, a horned helmet, a short sword, a shield and a halberd/mace combo. 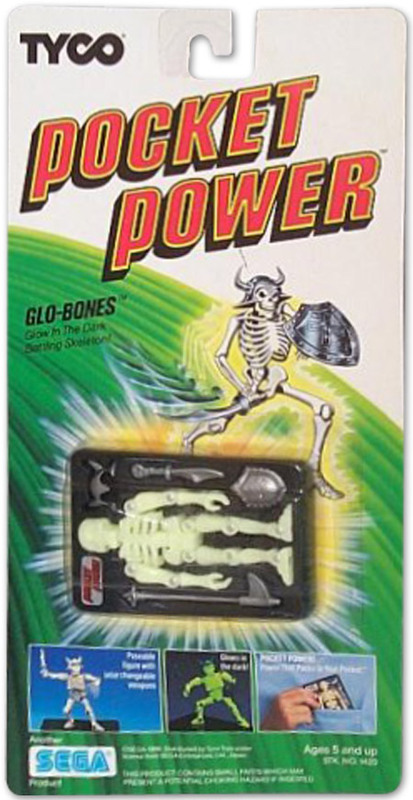 Unfortunately i have been unable to acquire a Glo-Bones as it is by far the most popular and sought after Pocket Power toy. With easily lost accessories, it is also one of the hardest to find complete as well. As you can imagine, that translates to a pretty high asking price at auction. To date, the highest i have seen a Glo-Bones sell for is $142.50 USD - although the average seems around about $80. 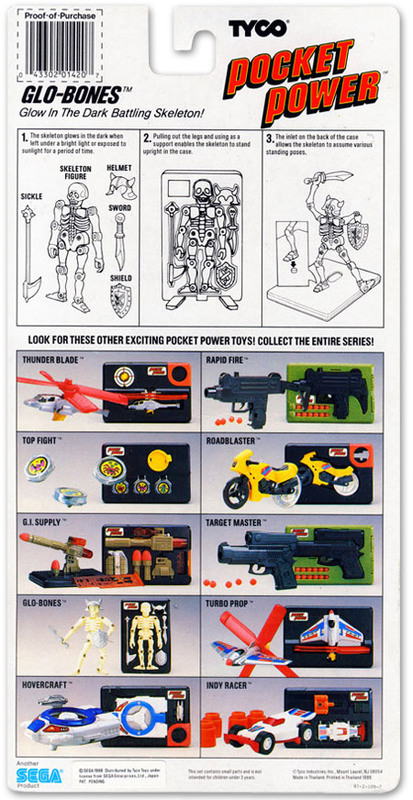 Comparatively, the Target Master and Rapid Fire guns both tend to sell for around $50, whilst the remaining Pocket Power toys go fairly cheaply, around $10-$30. 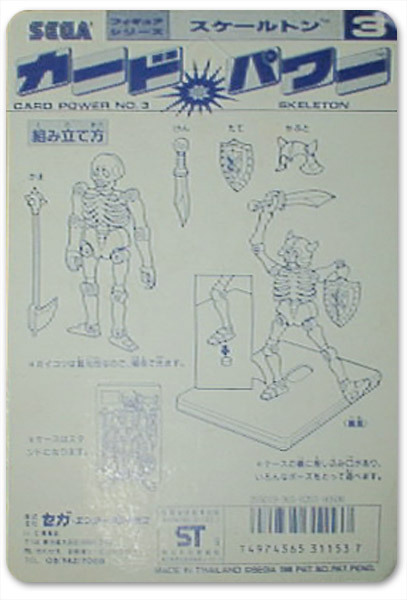 I have been able to confirm he was released as No.3 in the Japanese Card Power release, where he was simply named Skeleton and appears to have no differences to the western release - and is similarly difficulty to find. The good thing about his popularity is, there are already a number of websites with pictures, reviews or videos from fans which you can visit below - i'll expand this entry once i have acquired and played with Glo-Bones personally. Needless to say, if anyone reading this is willing to help me acquire Glo-Bones, please contact me (and remember my wife has to approve all purchases, so go easy!). The Pocket Power Hovercraft is a rip-cord powered hovercraft toy. 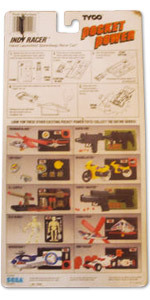 The Hovercraft is stored in the case along with a diecast weight in the shape of a gun, and the standard Pocket Power rip-cord. 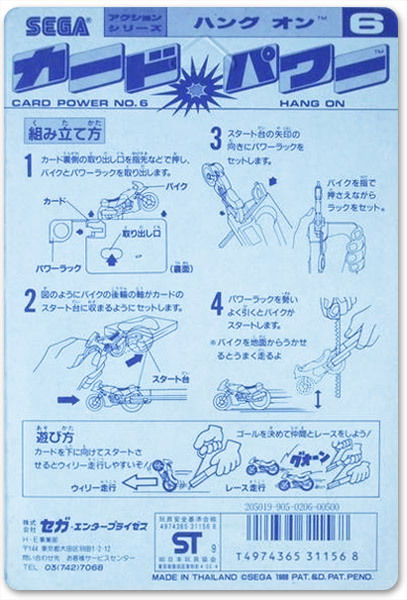 Unlike the other rip-cord Pocket Power toys, you have to remove the rip-cord rather than the vehicle before you can use this one, as it extends through the base and, if stored, stops you from opening a gate in front of the Hovercraft. 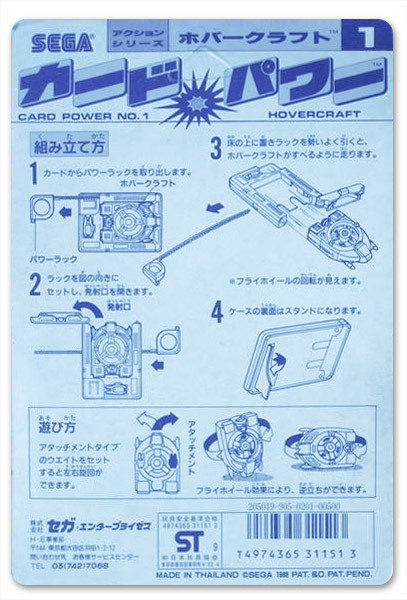 With the gate open, insert the rip-cord along the side marked with the text "IN", pull the rip-cord quickly and the Hovercraft will exit out of the case and fly across a hard surface using a spinning top style mechanism. The case also has a fold-out piece on the underside that allows you to set the case pointing downwards for a cleaner exit. Like Roadblaster and Top Fueler though, you do not need to use the case to launch, and often better results can be achieved by simply pulling the rip-cord and placing the Hovercraft quickly onto a hard surface. With no weight in place, the Hovercraft mostly drives forward with a bit of a sway depending on the surface. The diecast weight can be placed on either the left or right side of the Hovercraft - doing so will make the Hovercraft make left or right turns, culminating in a circular motion. 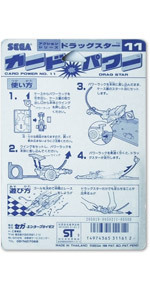 Interestingly, the Hovercraft can also spin on it's nose, and also on it's sides should you want it to, as depicted in the instructions. The Hovercraft itself is a solid feeling plastic, except for a diecast centre piece that functions as the spinner, which you can see spinning through openings on the top. Bizarrely, i have noticed some Hovercraft toys have a mirrored "IN" sticker that from no angle reads correctly! This may have been corrected in a later run of the toys as I have also seen correctly printed stickers. The Hovercraft that appears on the cross-sell has slightly different moulding compared to the released toy - at a glance they look identical, the changes are so minor. 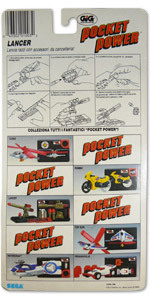 Possibly the cross-sell photo was a prototype like many other Pocket Power toys. 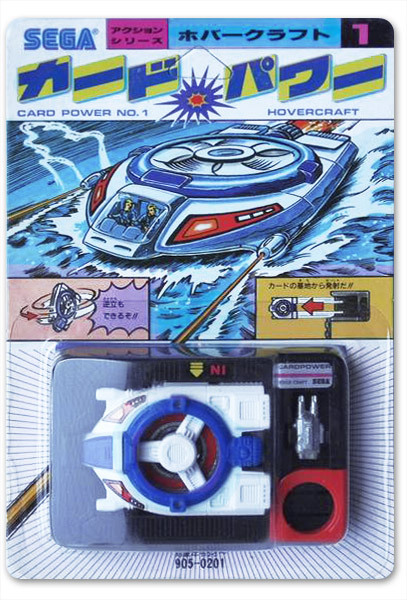 The Hovercraft was released in Japan as Card Power No.1 - whether this means it was the first designed or flagship toy i'm not sure - but it's definitely one of the cleverer and best functioning Pocket Power toys. They often show up at auction, but sometimes missing the weight. I haven't tried, but i assume anything with a bit of weight that you could stick to either side would function similarly - it's the rip-cord you don't want to miss out on! The Pocket Power Rapid Fire toy is a miniature sized airgun. The gun is stored in the case with its stock collapsed. Removing the gun by pushing on the underside of the case, you can then fold out the stock on two hinges. The case has 2 rows of 6 pellets that can be removed by opening a latch on the lower right. Up to 6 pellets can then be loaded into the gun via a compartment on the top that locks in place with another hinge. Due to the size, the actual trigger of the gun is non-functional; instead, the entire trigger component compresses in to fire the pellet with a clicking noise. The case also has 2 small stands on the right side, that can be folded out to allow the base to stand up on its own. This is because the back of the case has a target decal (with the hole where you eject the gun serving as the bulls-eye). Instead of the name Rapid Fire, the text Target Gunman Forever is printed at the top along with markers for 1x, 2x and 3x scores on the target. The pellets shoot a fair distance, often 5 meters or so and being so tiny, are very easy to lose sight of! Despite the name, the toy cannot rapidly fire when the trigger is pressed continually - but a few quick pulls will shoot off consecutive pellets fairly quickly. Given the size, it is difficult to tell where you actually hit on the target, even if you manage to sneak it through the bulls-eye, but the target is still a nice touch for play value. Rapid Fire is a highly sought after Pocket Power, particularly complete, as a lot that show up on auction are missing several pellets. The pellets themselves are said to be replaceable with generic airgun pellets, although i have not confirmed this. They seem to be in plentiful supply in a range of colours branded as Airsoft Pellets. Of note, the Rapid Fire seen on the packaging cross-sell (and TV advert) shows orange colour pellets whereas the toy actually came with yellow coloured pellets. Talking of colour, Rapid Fire together with gun partner Target Master are the only Pocket Power toys to utilize a green case - that is also the thinnest of all the cases. 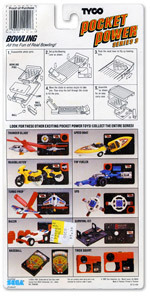 Another factor leading to its highly sought after nature could be that in 1989, the Americans for Democratic Action published a "Dirty Dozen" unsafe toys list. Interestingly, the Target Master Pocket Power was not on the list despite functioning similarly. From what i can gather, the toy itself was not banned, it was suggested that caution be exercised when using it. The Pocket Power Roadblaster is a rip-cord powered motorcycle toy. The motorcycle is stored in the case with it's handlebars collapsed. Removing it by pushing on the underside of the case, you can then fold out the handlebars to either side. Removing the rip-cord exposes a holding mechanism for the motorcycle on the case. Place the motorcycle in, and carefully thread the rip-cord through the slot near the back wheel, and then pull the rip-cord quickly to spin the back wheel and release the motorcycle onto a hard surface, watching it scoot away. The motorcycle itself is mostly plastic, but the back wheel is a solid piece of diecast. Whilst the holding mechanism is a thoughtful touch, often a better run can be achieved by not using it - simply inserting the rip-cord, pulling and dropping the bike onto a hard surface tends to work better. The bike has a sticker on either side that adds a nice bit of visual flair, although many that show up on auction simply have the sticker residue remaining! Being a motorcycle, it has trouble travelling more than a few metres before skidding out of control, but it's still fun to play with in confined spaces. Roadblaster seems to suffer from wear and tear more than other Pocket Power toys - the rip-cord slot on the bike is simply plastic, and pulling the rip-cord at an angle can often shred it away. 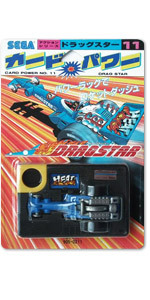 Roadblaster was originally named Hang On in the Japanese Card Power series, named after the Sega arcade game of the same name, similar to the Thunder Blade Pocket Power toy. The Pocket Power Target Master is a miniature sized airgun. 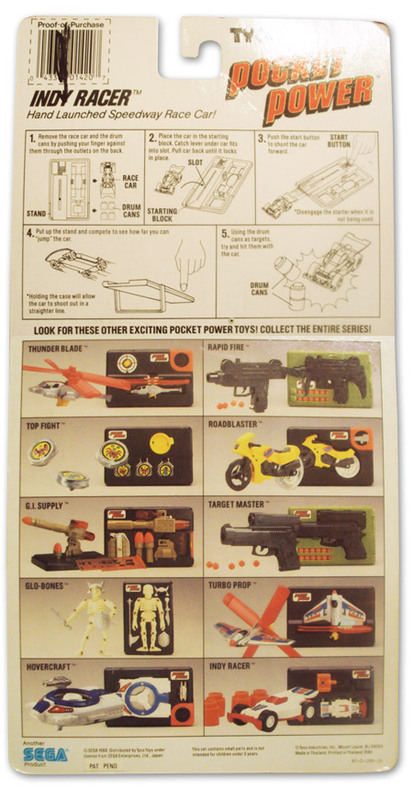 Unfortunately this is a toy i have been unable to acquire, but from the pictures it appears to be very similar to the Pocket Power Rapid Fire, but with a more typical handgun design. It has a large sight across the top, so it's possible the loading mechanism is slightly different - i'll reserve judgement until i have the toy in hand. 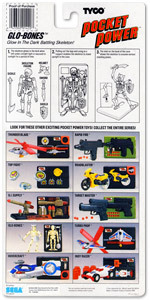 Note that the photo above is originally from an Ebay auction - and the only photo i have that shows the complete toy. But, it seems as if this seller had replaced his original pellets with orange pellets (perhaps to match the cross-sell image), as every other Target Master i've seen at auction has had yellow pellets just like Rapid Fire. If anyone reading this is willing to help me acquire Target Master, please contact me so i can expand this entry! The Pocket Power Turbo Prop toy is rip-cord powered airplane toy. The Turbo Prop airplane, which is not particularly realistic given the giant propeller on it's tail, is stored in the case with its blades collapsed. Removing Turbo Prop by pushing on the underside of the case, you can then expand the blades into a cross position and place it into the launcher on the back of the case. Remove the rip-cord from storage and insert it alongside the launcher slowly, and then pull out the rip-cord quickly while aiming Turbo Prop. Turbo Prop seems to work best with the launcher parallel to the ground and launching it vertically. Trying to make it fly it horizontally (as it appears in the TV advert), it's more likely to fizzle out onto to the floor. The connection point and launcher have a slightly different size compared to Thunder Blade & UFO, so you can't use those launchers with Turbo Prop. The design of Turbo Prop is probably my favourite of all the Pocket Power toys - I've always liked how it had a soft rubber nose for some reason, and the decals are really nice! A loose Turbo Prop seems fairly common on the auction sites, but a carded version has not come up as yet. Hand Launched Speedway Race Car! 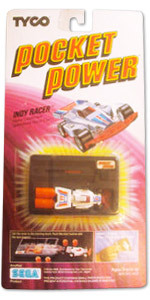 The Pocket Power Indy Racer is a spring-fired toy car. The case stores the car itself, and 4 barrels. Removing both by pushing through the underside of the case, the car can be set into a slot on the front of the case. Pulling back the car on the case, a clip underneath will contract the spring, whilst a hook at the tail end of the car latches onto a trigger mechanism. At this point, you can set up the barrels however you like - as side barriers forming a race track, or obstacle(s) to crash into. The barrels stack on each other so you can make a tower 4 barrels high as a single target. Pressing the trigger mechanism will launch the car out onto a hard surface, usually rolling about 1 metre or so in a fairly straight line. The case on it's left side also has a component that can fold down, allowing you to alter the launch trajectory a little bit. The instructions suggest you can compete to see how far the car will launch. Whilst not mentioned on the instructions, the case can also be pointed down towards the ground and fired - the front bumper of the car is angled such that it will often bounce off of the surface in a jump. 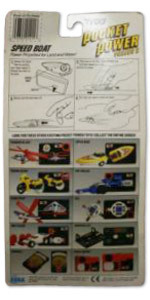 The packaging artwork, cross-sell photo and TV Advert all depict an Indy Racer different to the toy that was actually released, in a number of ways. Firstly, the decals on the car are different - instead of simple blue and red stripes, the actual car has a different stripe design and the number 17. The wheels appear to be white rather that chrome silver, and the trigger mechanism is a completely different design, with a large spring component that latches onto the trigger, so presumably the car itself would not have had the latch at it's end for the same purpose. 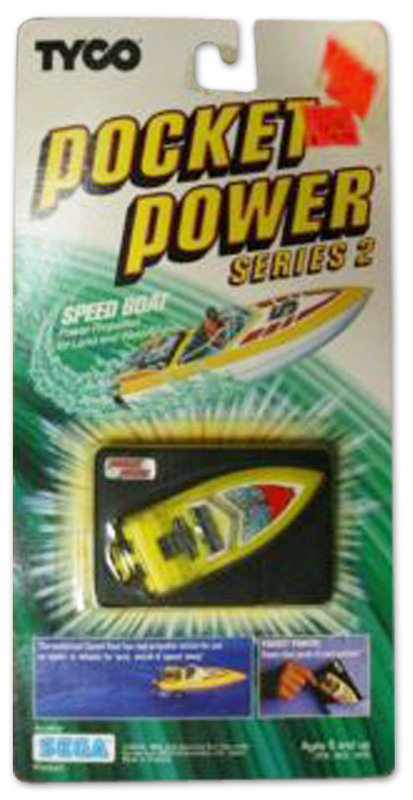 I'm unable to confirm, but it appears similar to the Pocket Power Speed Boat, in that some design changes were intended for the western market but not followed through. It may also be possible that alternative Indy Racer is an early prototype, as it appears slightly less elegant a design than the final release. Indy Racer has come up a few times on auction and surprisingly with all of it's pieces - the storage in the cases was definitely good for something! The Pocket Power Baseball is a miniature ball-bearing game. A clear shell houses a baseball pitch decal, with a spring loaded bat and a ball-bearing at the base. A slider on the right of the case pulls the ball-bearing up to the pitcher via a magnet underneath the playfield. Releasing the the slider sends it back towards the batter, where the player can push forward a level on the face of the case, to swing the bat. The top of the case has several channels to determine what the score of each shot was, which can then be marked with a dial on the left of the case, that shows up on the field via a cut-out in the decal. There are 3 runner pegs that can be placed in various locations - stored in a compartment on the underside of the case when not in play, on the bottom right of the case when not on a base, and on top of the clear shell when a base has been run. Baseball works quite well, although i was surprised when i stumbled upon a very similar toy from 1987 called Tomy Pocketfulls Baseball, so i don't think the guys at Sega deserve too much credit for this one! When i found the Baseball Pocket Power, it unfortunately did not come with the runner pegs - so i chopped up some Gundam runners, since finding the real pegs seemed like a true needle in a haystack scenario! The only evidence of the pegs exitinBut find them I did, when i uncovered the Japanese Card Power series! Coincidentally, the runners are included in the pack on a Gundam style runner rather than pre-cut, so i wasn't far off with my makeshift solution! Interestingly, the case for Baseball was also changed from it's white Card Power release, to black. 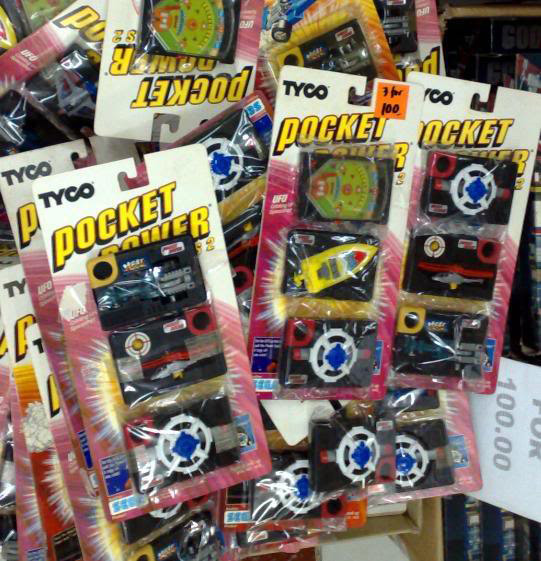 Whilst black is the dominant colour for Pocket Power toy cases, it is certainly not the only colour, so why they changed this, i don't think we'll ever know. Strangely, the cross-sell image on western packaging has white plastic for the channels at the top of the pitch, whereas the released toy is entirely black. Other than the text Pocket Power replacing Card Power on the decal, there appears to be no other differences. 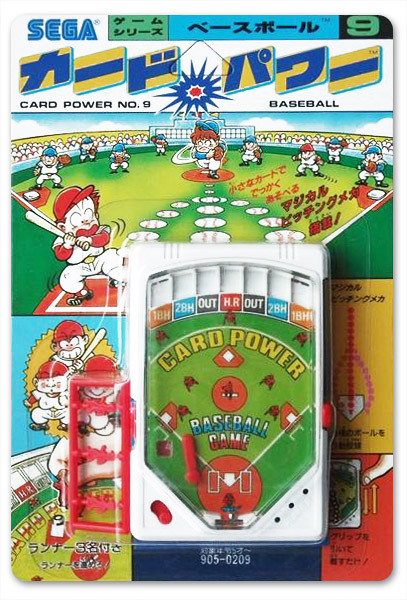 Baseball is also notable for being the only Pocket Power toy not to have the traditional sticker indentation anywhere on the case. 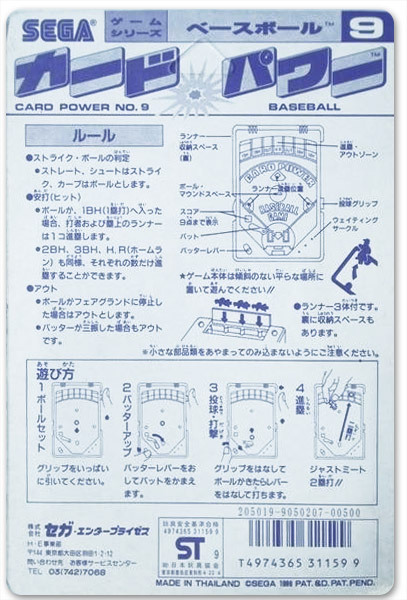 The final bit of interesting information is that Baseball is numbered 9 in the Card Power series - yet it didn't appear until Series 2 (and thus after the first 10) in the west. This leads me to believe that some of the western Series 1 toys weren't released in Japan (or were released later). 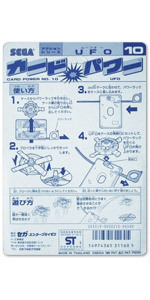 The Pocket Power UFO is the other toy that suggests this, being numbered 10 in Japan. I hope to confirm this when I take receipt of the Japanese releases, as whilst the packaging has no cross-sell, there appears to be a pamphlet within the blister bubble along with the toy, that may contain more information! Baseball is easily available at auction loose, but currently the only seller listing it is the same I purchased mine from - unfortunately they all appear to be missing the 3 runner pegs. 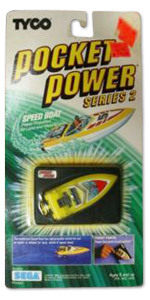 The Pocket Power Speed Boat is a spring pullback toy. 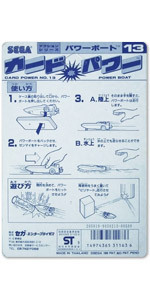 The case consists of just the boat itself and is therefore one of the simplest Pocket Power toys. Remove the boat by pushing from the underside of the case, place it on a hard surface and pull back, then release to set the Speed Boat off. It is essentially the same as the famous Choro-Q or Penny Racers toys (but without the penny slot). The boat also has a propeller at the back that is is linked to the spring and spins on release. This aids the boat in performing on water - together with a nifty foam piece within the shell, that prevents sinking. 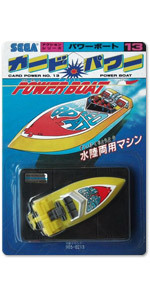 For what appears to be the first pullback Pocket Power toy, a boat was certainly an odd choice! That said, pulling back the boat and holding the tyre, it is possible to place the boat in water and let it go - it'll float and still propel forward. 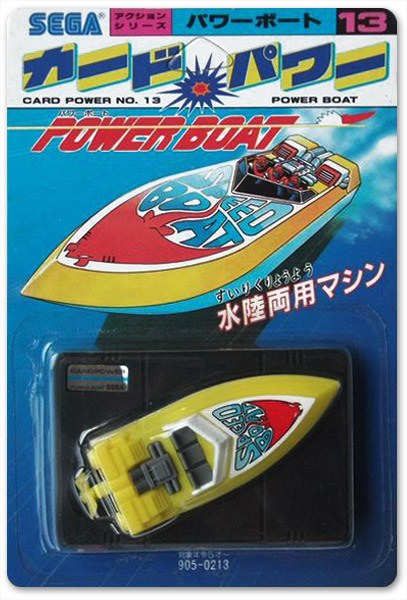 Called Power Boat in the Japanese Card Power release, the artwork on it's packaging accurately reflects the toy, with a manta/sting ray and the text Speed Boat - but why it doesn't say Power Boat, i don't know! The western release however, on both the cross-sell and the front of the packaging artwork depicts a different decal - some red chevrons and the number 5. It seems to indicate that a new decal was intended for the western release but never followed through, as all versions that have shown up on auction sites only have the Speed Boat decal. 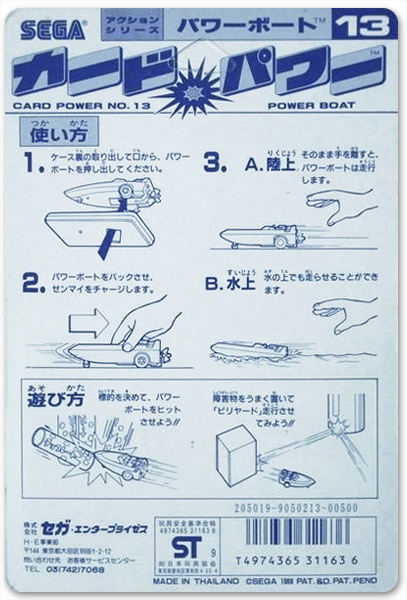 Whilst the Speed Boat does what it does very well, it isn't one of the more complex Pocket Power toys - the Japanese packaging resorting to suggestions of using it to knock over obstacles (a shame none were included like the Pocket Power Indy Racer), or ricochet off of walls to turn (made possible by the shape of the nose). I do remember having fun with it in the bath though! It seems to be one of the rarer toys based on auction appearances, but at least there aren't many parts to lose on this one! 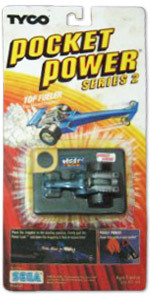 The Pocket Power Top Fueler is a rip-cord powered dragster toy. The dragster is stored in the case along with a detachable spoiler. Removing both by pushing from the underside of the case, you can then attach the spoiler to the back of the dragster. 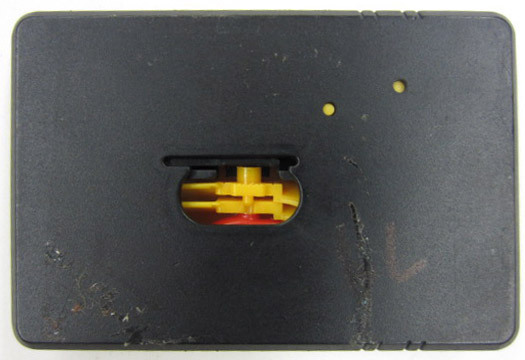 Remove the rip-cord and turn the case over to locate a holiding mechanism. Place Top Fueler in, and carefully thread the rip-cord through the slot near the back wheel, and then pull the rip-cord quickly to spin the back wheel and release Top Fueler onto a hard surface, watching it scoot away. Top Fueler is mostly plastic, but the back wheel is a solid piece of diecast. Whilst the holding mechanism is a thoughtful touch, often a better run can be achieved by not using it - simply inserting the rip-cord, pulling and dropping the dragster onto a hard surface tends to work better. Top Fueler works a lot better than the Series 1 Roadblaster, although it functions basically the same. Becuase it's wider, it won't fall over so easily, despite having only one wheel, causing a tilt to one side. Again improved from Roadblaster, the slot for inserting the rip-cord seems stronger and less prone to stripping away. In one of the better cases of the cross-sell not matching the actual toy, Top Fueler has a cool "HEAT" decal on it's spoiler - the cross-sell has no decal at all! 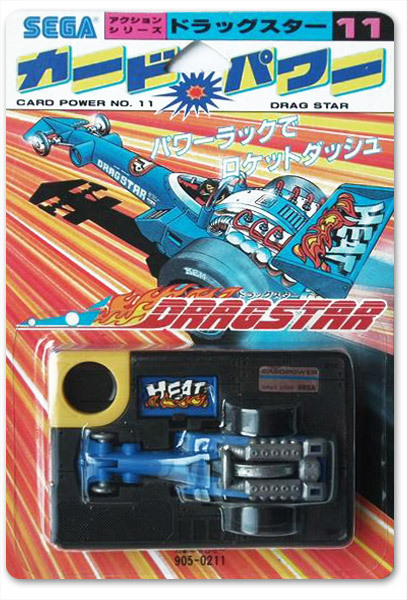 Top Fueler was originally named Drag Star in the Japanese Card Power series, and does not seem to fetch a high price on auction sites, so it's a good Pocket Power toy to get! 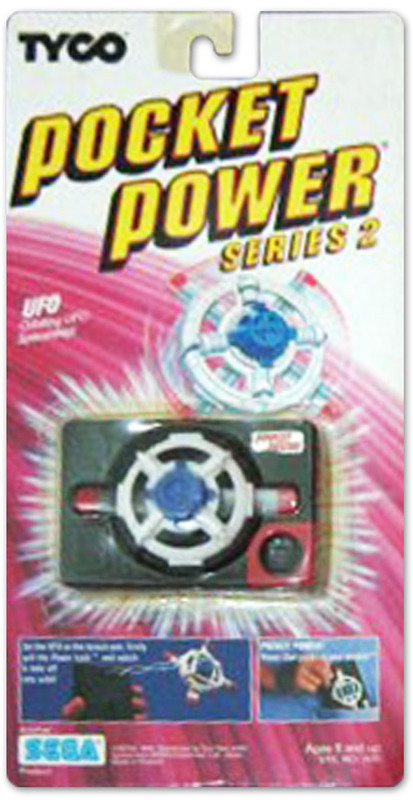 The Pocket Power UFO toy is a rip-cord powered UFO toy. 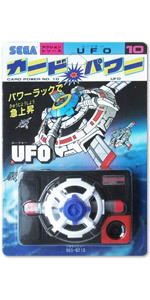 The UFO is stored in the case with its blades collapsed. Removing the UFO by pushing on the underside of the case, you can then expand the blades into a cross position and place it into the launcher on the back of the case. Remove the rip-cord from storage and insert it alongside the launcher slowly, and then pull out the rip-cord quickly while aiming the UFO. 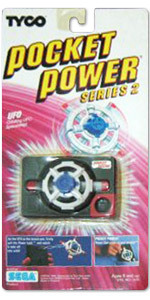 Probably due to the shape and balance, UFO seems to fly the best out of the 3 aircraft Pocket Power toys. When you get a good flight, it also makes a nice whirring sound, i'd say from the gaps in the design. 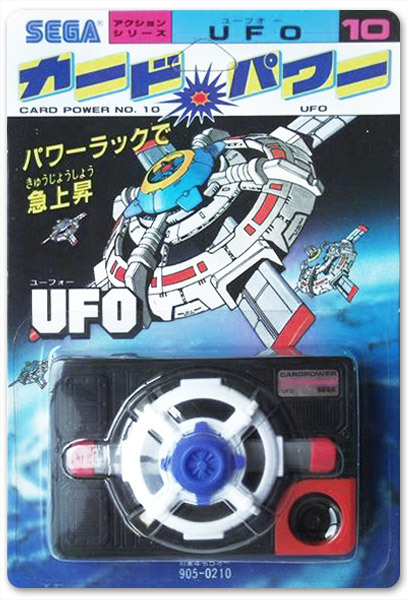 Like Thunder Blade, UFO feels a bit flimsy but was probably designed as such for greater airborne potential. It only consists of a couple of pieces of plastic and has no decals, which is a shame considering the added detail on the artwork of the Japanese Card Power packaging - however the western packaging does not contain those details. 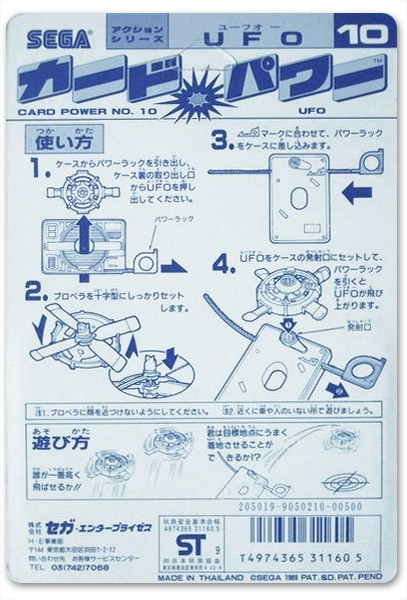 The final bit of interesting information is that UFO is numbered 10 in the Card Power series - yet it didn't appear until Series 2 (and thus after the first 10) in the west. This leads me to believe that some of the western Series 1 toys weren't released in Japan (or were released later). 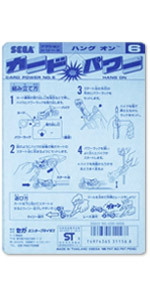 The Pocket Power Baseball is the other toy that suggests this, being numbered 9 in Japan. I hope to confirm this when I take receipt of the Japanese releases, as whilst the packaging has no cross-sell, there appears to be a pamphlet within the blister bubble along with the toy, that may contain more information! UFO has not been seen at auction carded but can be had fairly easily loose and complete. It works great so i'd say this is the one to get, if you only want one of the aircraft Pocket Power toys! Telescope, Signal Mirror, Compass and Much More! 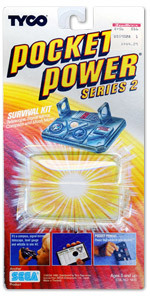 The Pocket Power Survival Kit toy is exactly as it's name implies - a survival kit! The case has no components that are supposed to be removed (you can detach some if you want, but why you would i'm not sure!). It consists of a telescope, a compass, a morse code signaler, a level gauge, a whistle and a ruler to top off a very tightly packed case! The telescope consists of 2 lenses that fold up - one of which is connected to a sliding panel that when moved, adjusts the level of magnification. In reality, the plastic is very hazy and you can barely make out any magnification. I would imagine most kids ended up using this feature to toast grass and ants with varying levels of success! The compass sits on the lower left and seems to function correctly, helping oyu find magnetic north. To the right, is the level - a simple ball-bearing indicates the curvature of the surface as best you could imagine. Far right sits the whistle, which functions exactly as you would expect and makes a decently loud noise. The bottom edge of the case serves as a measuring ruler - albeit a very small one! In the centre is a spy-hole which you can look through to target your morse code signals. The signals are fairly weak; a mirror like surface printed on the back (with morse code reference) reflects sunlight. 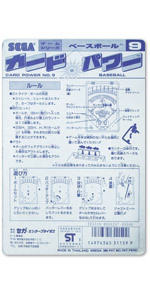 The back also has an illustration detailing this functionality. 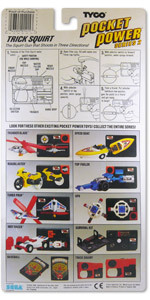 Like Speed Boat and Indy Racer, Survival Kit shows a different version of the toy in cross-sell and packaging artwork. The first is a decal between the magnifiers, which does not appear to be on the final toy. The toy i picked up on Ebay didn't have one, and i'm pretty sure my childhood one didn't either, but not 100% - so i would like to see a carded version to confirm! Interestingly, the Japanese Card Power release does have a decal which appears similar, but ultimately different than that shown on the western packaging. Whilst the western artwork appears to depict a grid of numbers or letters, the Japanese release has some diagrams and the words Understood and Not Understood. Unfortunately I can't figure out exactly what it's illustrating! Finally, the instruction photography on the Survival Kit packaging depicts a completely different back mirror panel as well! This could be once again, simply a photo of an early prototype, or a sign of intention to change but not following through. 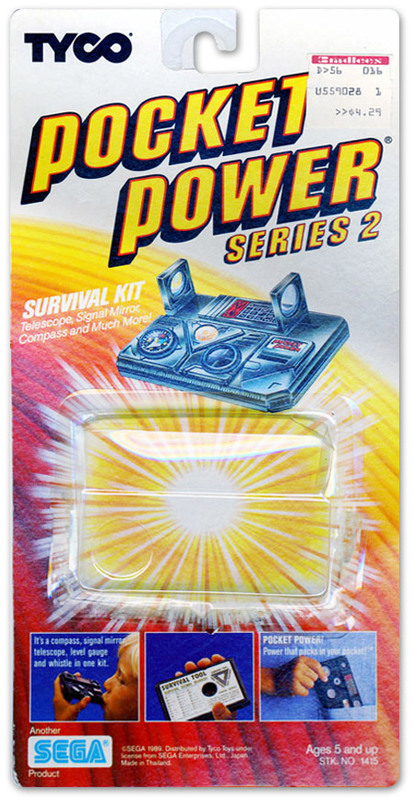 The Survival Kit is one of the most intriguing Pocket Power toys - but i have not seen very many show up at auction - if you find one, my advice is to get it! 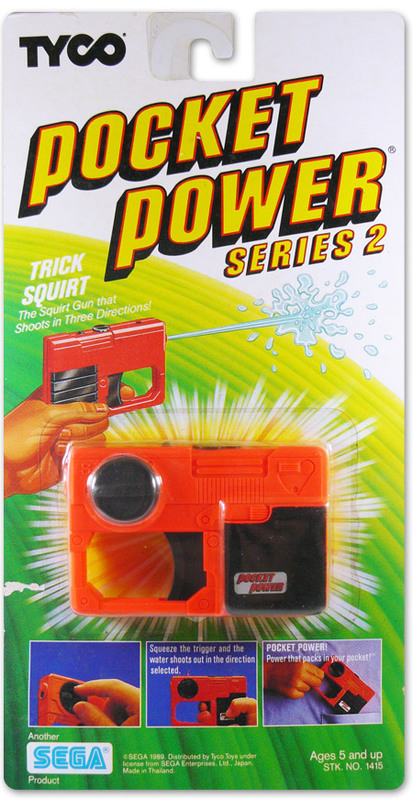 The Squirt Gun that Shoots in Three Directions! The Pocket Power Trick Squirt is a multi-directional water pistol. 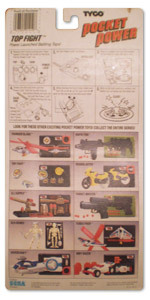 The case in this instance is the entire toy - the only removable piece is the small plug on the top, which when removed allows you to fill the gun with water. Placing the the stopper back in place, you can then turn the dial on the side in preparation for firing. There are 4 positions. For safe-keeping, there is a position marked "S" that blocks the gun from firing, allowing the gun to be carried without fear of spraying in your pocket - although some may still dribble out. The other 3 positions all directly correspond to trajectories the gun can fire in - the standard forward, directly upwards, and backwards at a 45 degree angle. Much hilarity ensues when an unknowing user is handed the gun with the dial in the 45 degree backwards position - expecting it to fire forward like a regular water pistol, it instead shoots them in the face! It can also fly over the back of the person's head, but this is obviously dependent on where the gun is held in relation to the face. The directly upwards position seems to be for situations where you might be showing the gun to somone - tilting it down, you can fire it whilst they're not expecting it (and if they were - expecting it to fire forward) right into their face. The pistol doesn't pack a lot of power but will shoot over a couple of metres. It's a lot of fun and quite unique - the only other water pistol i've seen like this was more traditional - it had a hose like a vacuum cleaner that you would bend to shoot around corners - but it could not shoot back at someone. Being pocket-sized, there is a pretty small limit to how much water you can store, so it seems mostly intended for the odd squirt rather than a serious water pistol fight. It's a lot like the water pistol equivalent of the hand buzzer - a practical joker's best friend! Unique among the Pocket Power toys, this one is a bright orange colour. Perhaps they wanted to play it safe after Rapid Fire got on that dangerous toys list - maybe we have Pocket Power alone to thank for overly strict toy gun regulations? It may just be a stylistic choice though, since it looks pretty cool regardless! The trigger mechanism is very smooth and the toy feels solid, making this one of the cooler Pocket Power toys. Trick Squirt seems fairly common at auction and mostly complete thanks to lack of pieces. All the Fun of Real Bowling! The Pocket Power Bowling is a ball-bearing Bowling toy. Unfortunately i've been unable to find Bowling - so information is scarce! 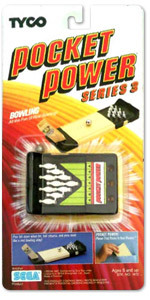 The Bowling packaging however confirms that there was in fact a Series 3 release of Pocket Power toys. Because of this, it is currently assumed then that Lamborghini, Submarine and Skateboard all belong to Series 3. Unfortunately this cannot be confirmed because the Bowling packaging simply repeats the same cross-sell as seen on Series 2 packaging. 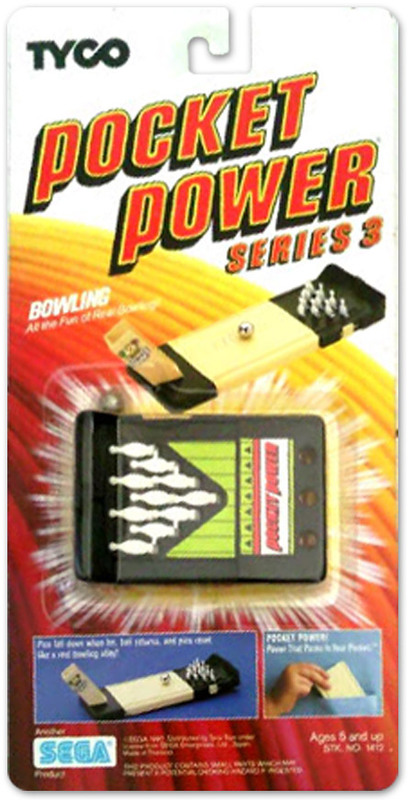 Bowling appears to be one of the most interesting Pocket Power toys and based on zero auction appearances, also one of the rarest. I would love to get my hands on it, so if you can help me acquire one please contact me! The Pocket Power Lamborghini is the first of 3 mystery Pocket Power toys. 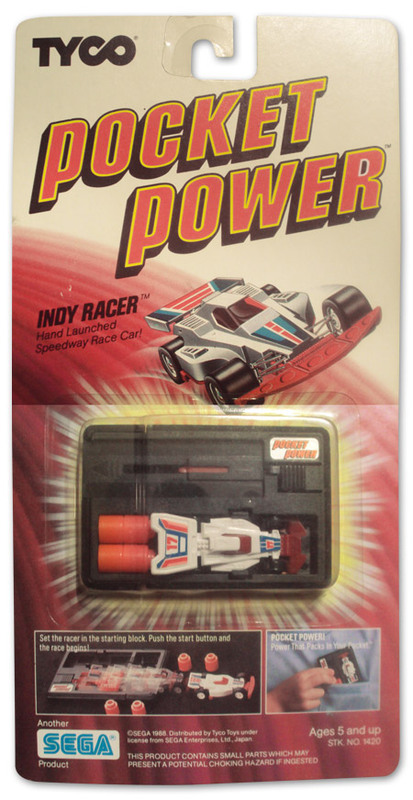 Lamborghini is just the assumed name - it was first found to be a Pocket Power toy via it's appearance on the Virtual Toy Chest Pocket Power Listing. As it does not appear on any of the cross-sells, it is assumed to be part of Series 3. Seemingly very rare then, I have only seen the case (but no car) come up at auction once. Unfortunately I didn't win, so there is no more information other than what we can guess from the lone picture. It looks to be, like Speed Boat, a spring pullback toy, with no accessories. At least this one is a car and makes sense! If you have any information or would like to help me acquire a Pocket Power Lamborghini, please contact me! 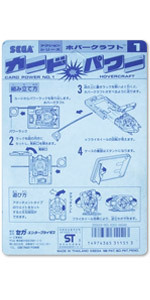 The Pocket Power Submarine is the second of 3 mystery Pocket Power toys. 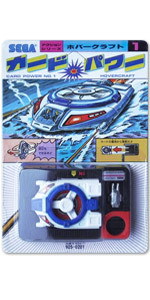 Submarine is just the assumed name - it was first found to be a Pocket Power toy via it's appearance on the Virtual Toy Chest Pocket Power Listing. As it does not appear on any of the cross-sells, it is assumed to be part of Series 3. Seemingly very rare then, I have seen this toy come up at auction once, and it was complete as well. Unfortunately I didn't win, so there is no more information other than what we can guess from the lone picture. It looks to be, like mystery Pocket Power mate Lamborghini, a spring pullback toy, with no accessories. Like Speed Boat though, this one makes little sense! That makes 2 spring pullback toys in Series 3 - had they run out of ideas? 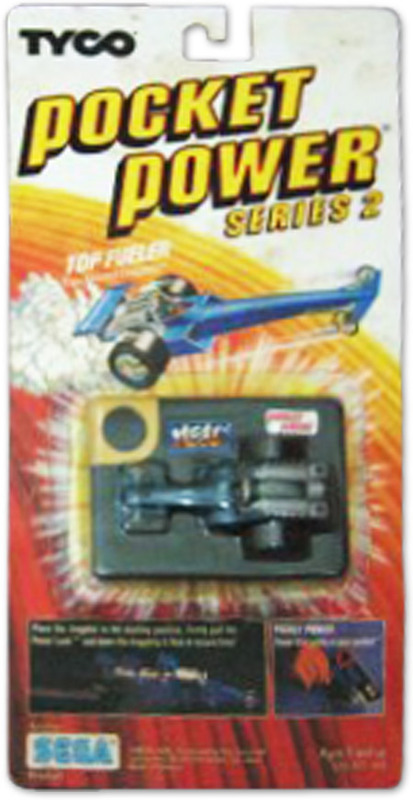 I did see one auction listing 3 Series 1 Pocket Power toys, and a blue spring pullback buggy toy. It had no case so there was no way to tell if it was also a Pocket Power, but i did have my suspicions - will it show up again one day? 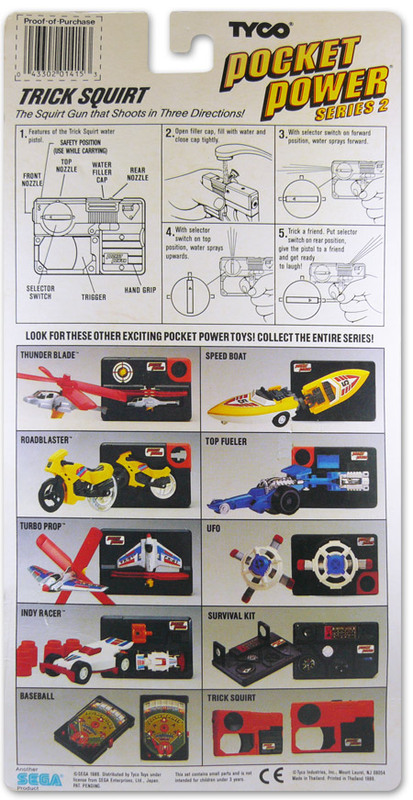 If you have any information or would like to help me acquire a Pocket Power Submarine (or the mysterious blue buggy! ), please contact me! The Pocket Power Skateboard is the final mystery Pocket Power! Skateboard is just the assumed name - it was first found to be a Pocket Power toy via it's appearance on the Virtual Toy Chest Pocket Power Listing. As it does not appear on any of the cross-sells, it is assumed to be part of Series 3. 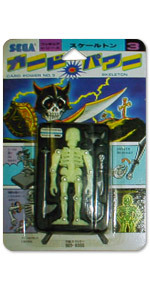 Seemingly very rare then, I have seen this toy come up at auction once, and it was complete as well. Unfortunately I didn't win, so there is no more information other than what we can guess from the lone picture. It appears as though the Skateboarder can bend at the waist, and peg into 3 holes on the Skateboard. Tetsuwan Convoy of Tets' Toys & Shenanigans theorizes that Skateboard functions similarly to Hovercraft because of the bending waist (acting as a weight to alter the movement direction) - sounds like a good theory to me! If you have any information or would like to help me acquire a Pocket Power Skateboard, please contact me! 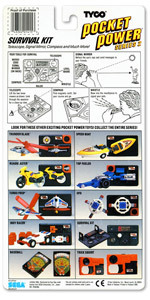 Pocketpowertoys.com is an unnoffical fansite and not affiliated with Sega or Tyco.